In a clean glass or metal bowl, beat the egg whites with an electric mixer until they can hold a stiff peak. Set aside. Mix together the flour, baking powder, salt, baking soda, sugar, egg yolks, melted butter and buttermilk at one time and beat until smooth. Gently fold in the egg whites last. 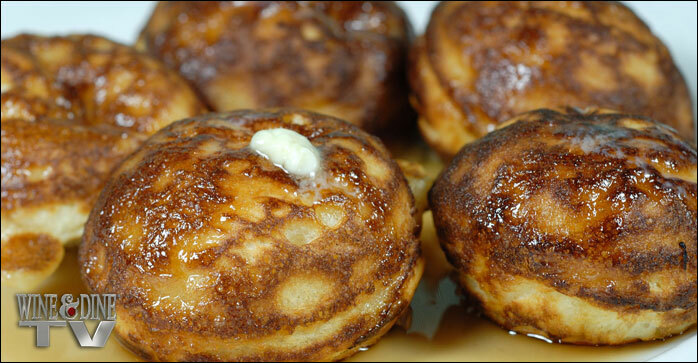 Put about 1 tablespoon of vegetable oil in the bottom of each aebleskiver pan cup and heat until hot. Pour in about 2 tablespoons of the batter into each cup. As soon as they get bubbly around the edge, turn them quickly (Danish cooks use a long knitting needle, but a fork will work). Continue cooking, turning the ball to keep it from burning.